New Delhi : Reliance Jio on Thursday introduced a variety of ‘Prime Benefits for all JIO Prime customers, including triple cashback of up to Rs 2,599 on every recharge of Rs 399 or above. 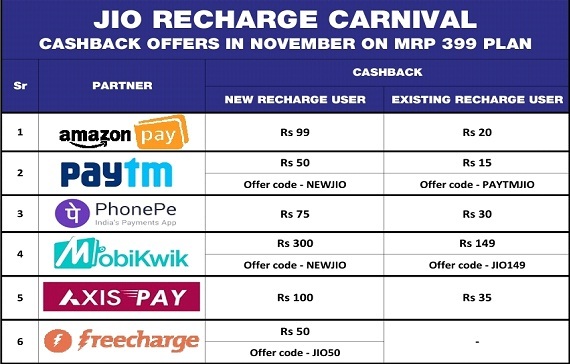 The triple cashback offer includes 100 per cent cashback vouchers of JIO worth Rs 400 on every Jio tariff plan recharge of Rs 399 or above and instant cashback of up to Rs 300 on every recharge by JIO's partner wallets including leading digital payment wallets like AmazonPay, AxisPay, FreeCharge, Mobikwik, PayTM and PhonePe. The exclusive Jio Prime benefits will be available during the offer period from November 10-25, 2017. The cashback redemption availability will have three categories - the Jio cashback vouchers worth Rs 400 (Rs 50 x 8) will be provided instantly in MyJio, for redemption from November 15, 2017; the instant cashback from partner wallets will be credited to user wallets instantly and the e-commerce vouchers will be available from November 20, 2017 onwards.